A refinement of the standard level-set function which computes a speed term and advection term based on pseudo-Canny edges. 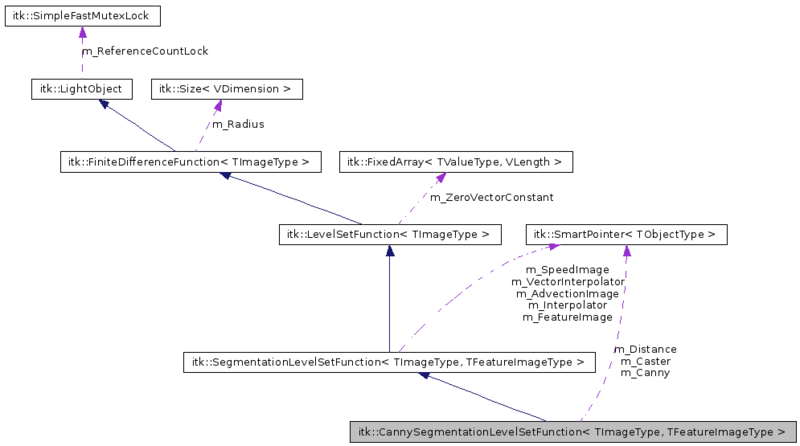 See CannySegmentationLevelSetImageFilter for complete information. Definition at line 33 of file itkCannySegmentationLevelSetFunction.h. 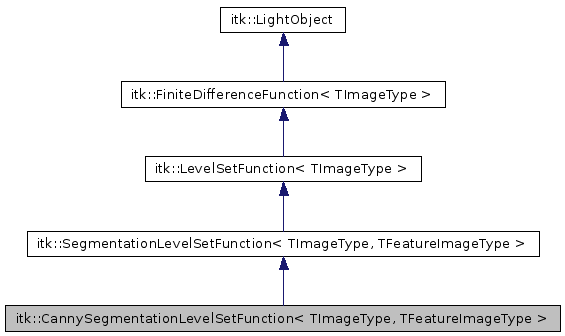 Reimplemented from itk::SegmentationLevelSetFunction< TImageType, TFeatureImageType >. Definition at line 42 of file itkCannySegmentationLevelSetFunction.h. Definition at line 43 of file itkCannySegmentationLevelSetFunction.h. Definition at line 55 of file itkCannySegmentationLevelSetFunction.h. Definition at line 49 of file itkCannySegmentationLevelSetFunction.h. Definition at line 41 of file itkCannySegmentationLevelSetFunction.h. Definition at line 56 of file itkCannySegmentationLevelSetFunction.h. Definition at line 53 of file itkCannySegmentationLevelSetFunction.h. Definition at line 38 of file itkCannySegmentationLevelSetFunction.h. Definition at line 40 of file itkCannySegmentationLevelSetFunction.h. Definition at line 54 of file itkCannySegmentationLevelSetFunction.h. Definition at line 101 of file itkCannySegmentationLevelSetFunction.h. Definition at line 109 of file itkCannySegmentationLevelSetFunction.h. Compute the advection image. The Advection Image is the gradeint image attenuated with the distance to the canny edges. Compute the distance image. This is the distance to the canny edges. Compute the Speed Image. The Speed Image is the distance to the canny edges. Definition at line 97 of file itkCannySegmentationLevelSetFunction.h. Definition at line 65 of file itkCannySegmentationLevelSetFunction.h. Definition at line 72 of file itkCannySegmentationLevelSetFunction.h. Definition at line 88 of file itkCannySegmentationLevelSetFunction.h. Definition at line 63 of file itkCannySegmentationLevelSetFunction.h. Definition at line 70 of file itkCannySegmentationLevelSetFunction.h.